Turn your Facebook page likes into bookings. HotelRunner allows you to offer direct booking functionality through Facebook. Want to accept reservations from your Facebook page? Let your Facebook page promote your hotel, your rooms, amenities, and services. This will allow fans to book rooms, post photos, submit a review, and recommend your hotel to their friends. Your Facebook page includes a built-in booking button and without any extra work, all your rates, promotions, and special offers are automatically updated on your hotel’s Facebook page. The flexible promotion engine integrated onto HotelRunner’s booking engine allows you to incentivize your guests to share their upcoming trip with their friends on Facebook as soon as they’ve booked a room, without leaving the purchase funnel and your website. 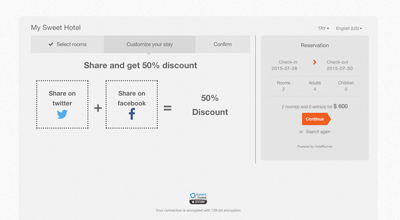 Reward your fans who share their reservation information on Facebook with social promotions. Go viral and engage their friends to turn them into future guests.